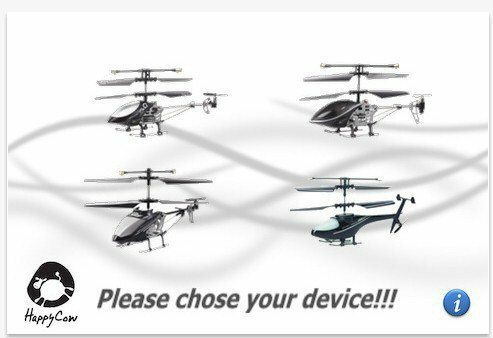 If you have a penchant for remote controlled devices, especially helicopters and you own an iPhone, iPod Touch or Apple iPad along with an iHelicopter, or thinking about purchasing one as a hobby, you might like to know that the I-helicopter app for iOS devices is now available. The i-helicopter app for iOS devices can control your helicopter one the user has connected the transmitter to the audio jack of their iOS device and is an application of five parts. One the left screen sits the helicopter’s throttle that flies the chopper by moving forward and lands the helicopter when moving backwards; the right screen controls the chopper’s direction by moving up/down left/right. At the bottom centre of the screen there is a “trimmer” which adjusts the helicopter to left or right when it is rotating in the air, while centre screen there is an on and off button to start and stop the controller, whilst in the upper right corner there is a switch to turn off the g-sensor control. Now one would think that purchasing a remote control helicopter would be somewhat expensive, but it turns out that it’s not and the price of the iHelicopter, of which there are four types the 777-107, 777-171, 777-172 and 777-173 all cost the same at $59.95, which isn’t really that much for hours upon hours of flying fun, and you even get free shipping anywhere in the world. So back to that i-helicopter app for iOS devices, for those wishing to grab the application you can so as by downloading the free app to your Apple iPad, iPod Touch or iPhone by hitting up iTunes, and just so you can check out the iHelicopter in action we have a little video for your viewing pleasure below, so don’t forget to check that out…enjoy. Check out their facebook, i-helicopter.